Are you sick and tired of driving your car to and from work? Are you too lazy to ride a traditional bike, or are you scared of riding a motorcycle? That’s okay, because there’s a different option. Modern battery technology has created a new form of transportation that’s fun and anybody can use it. This new way to travel is called the electric bike. 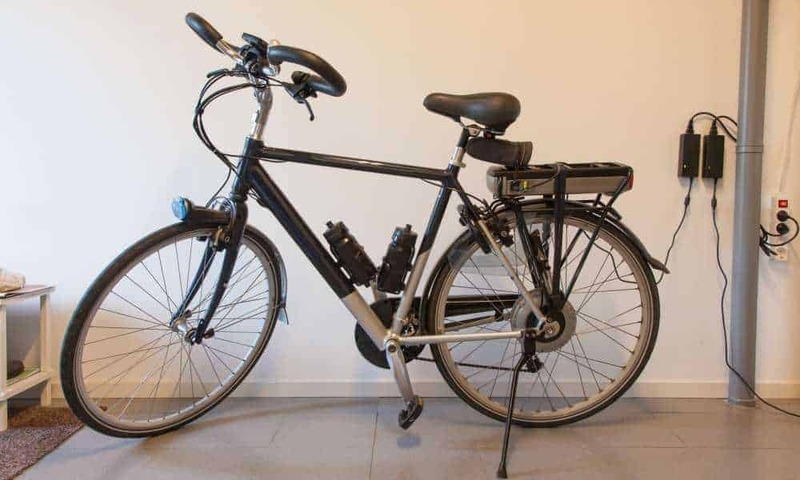 An electric bike is a bicycle that can be operated normally, but it also has an electric motor installed that’s powered by an onboard battery pack. Using the electric motor, you can cruise around town without having to pedal. If you think you could use an electric bike, you’re in the right place. Electric bikes tend to be quite a bit heavier than traditional bikes. When you add an electric motor and some large batteries, you end up with a substantial vehicle. Depending on your situation, you may need to lift or carry your bike regularly, like if you live upstairs. Make sure your new electric bike is not too much for you to handle, so you can lift it if you need to. Compare the weights of different electric bikes and choose one that’s good for you. 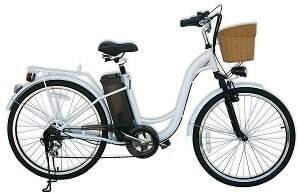 Different electric bikes have different electric motors. Electric motors are usually rated in number of watts. Typical motors found on electric bikes run from around 250 watts up to 1000 watts, and higher wattage motors deliver much more performance. If you need to power up some steep grades or hills, you need as much power as you can afford. Consider your normal routes, but in general the more power the better. Most electric bikes are tested so the manufacturer knows how fast it can go. Average top speeds for electric bikes run from 10 to 30 miles per hour. More powerful motors usually achieve higher top speeds, but it depends upon the gearing of the motor to the wheel. Total range is important to figure out if you can get to and from your destination without needing a charge. Ranges are expressed in averages, usually from 10 to 30 miles on a single charge, depending on the rider’s weight, how the bike is ridden, and the terrain covered. Pay attention to the bike’s top speed and average range. You’re going to experience much higher speeds on an electric bike, so you need to make sure you can slow down and stop for everyone’s safety. Carefully examine the braking system on any electric bike, and read up on customer reviews to see how they perform in real life situations. Brakes are the most important feature to look for. Different bike makers use different battery technologies. In the past, they used a single large battery, but modern technology allows the use of several smaller lithium ion battery cells linked in series to achieve the same total voltage. Also look for charging times and if a charger for your new bike is included. If it’s not, you’re going to want to order one right away. Finally, take a good look at the bike features you get with your new electric bike. Imagine that the batteries are dead, and now you’re going to have to pedal your way home. 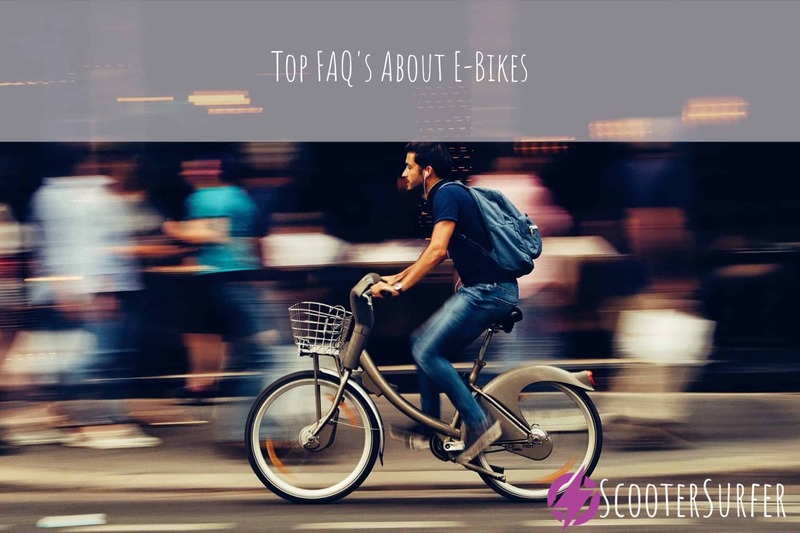 Look at features you normally would for a bike purchase, like the number of gears or speeds it has, pedals, wheel size, frame material and construction, and any accessories you might want like a basket, rack, or lights. Remember that this is still a real bike, and you want it to be able to be used like one when you run out of juice. 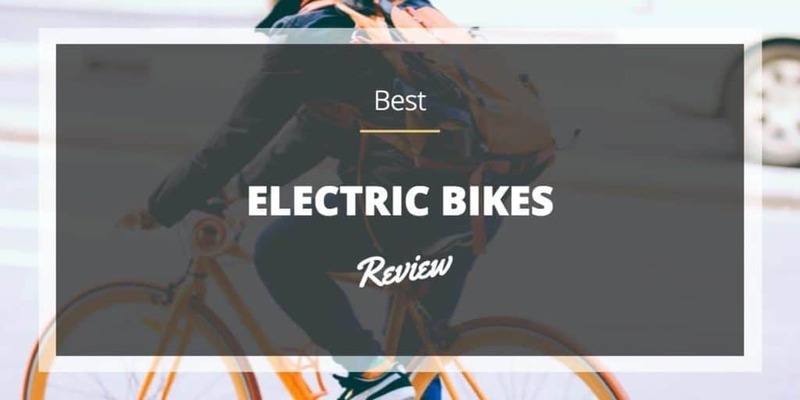 If you’re looking for the best electric bikes for 2017, here are some of the top rated and reviewed products in the market today. This XP Cargo-electric bicycle from Watseka Bikes will get you where you need to go in style. The word “Cargo” in the name of this bike is due to the fact that you can carry some cargo on this bike. It comes with a large handlebar mounted basket in the front and a handy rack on the rear that you can strap more gear onto. This bike lets you bring your stuff. It’s easier to get on and off of this electric bike, because it has a non gender specific step through frame. There’s no crossbar to impede your leg, so you can quickly step off this bike, and it’s super easy to get on. This design is to help with the functionality for delivery/courier users who get on and off their bike all day long. The motor on the ﻿Watseka electric bicycle is a 250-watt brushless motor that runs off of a 36 volt, 9 amp hour battery pack. All by itself, or using the optional pedal assist, this motor gives you plenty of power to cruise around town. The performance specs from testing of the Watseka bike put the top speed at around 14 miles per hour, and the average useful range at 16 to 18 miles, depending on weight and terrain. That’s pretty good range for an electric bike. The Watseka electric bicycle is fine for the price. It’s on the heavy side, the battery technology is a bit dated, and it’s pretty basic. For average users, it will be fine. For people who want some performance, you should look elsewhere. Rating 3 out of 5. 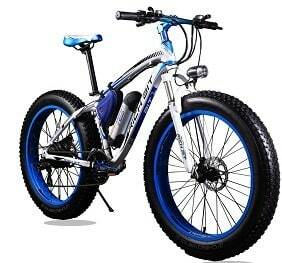 This richbit updated electric bicycle is a fully capable mountain bike that just happens to have electric assist. It’s a great combination. The foundation of every great bike is a quality frame, and that’s what you get with the Rich Bit. The frame is constructed of all aluminum tube, which keeps the weight down and the strength up. The front fork is also aluminum, and has suspension to boot. Quality frame and fork are a great place to begin on this bike. The Rich Bit electric bike features 26-inch spoked wheels with wide rims. The wide rims are to accommodate the 4-inch fat tires that are mounted on the wheels. 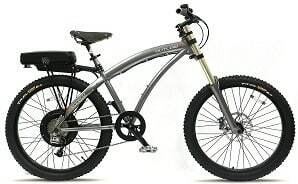 Large diameter wheels with fat tires and front fork suspension are a great combination to eat up the harshest terrain. This electric bike is built for serious off-road use. To keep this electric bike high performance, Rich Bit gave it a powerful 350-watt brushless electric motor that’s powerful enough to climb hills in the 15-30 degree range. The electricity to spin the motor is supplied by a 36 volt, 10 amp lithium battery that you can recharge every night with the included battery charger. Just plug it into a standard outlet for 2-4 hours, and you’re ready to go. The top speed and range for this electric bike are listed as 35 km/h and 40-60 kilometers. That’s 22 miles per hour and an average range of 25-37 miles, depending on the rider’s weight and the overall riding conditions. That’s a pretty impressive top speed and great range for an electric bike. If you’re looking for a real mountain bike with electric assist, you’ve found it. The Rich Bit is the real deal, and it’s top to bottom fitted with great components. This bike really performs plus it’s available in four different color combinations. A great package. Rating 4.5 out of 5. The Outlaw﻿﻿ Electric Bicycle from Prodeco Technologies is another high-performance electric bicycle with a bunch of great features. The Outlaw features one of the biggest electric motors available on an electric bike. The rear-mounted direct drive motor puts out 750 watts of power, which is plenty for everyone. Torque is plentiful, so this bike can even haul larger people up some substantial hills. When you’ve got a lot of power, you need the stopping power to match. The Outlaw bike has plenty, since it’s equipped with Elixir 5 hydraulic disc brakes front and rear. You’ll love the ability to stop on a dime while you’re riding the Outlaw. To supply the juice for the powerful motor, Prodeco installed a 51.2 volt, 32 cell LiFePO4 battery that’s rated at 9 amp hours. This power plant allows the motor to peak at a whopping 1.6 horsepower, and then charges in a few hours with normal 110 volt AC power. The top speed of the Outlaw electric bike has been clocked at around 20 miles per hour, and the range you can cover on one charge is anywhere from 25 to 30 miles, depending upon the rider’s size and the terrain. These are good numbers for a bike with this much power. If you’re looking for performance, you won’t find better than the Outlaw’s peak output of 1200 watts, or the stopping power of dual hydraulic disc brakes. Drawbacks include the hefty price and the limited gearing with an 8-speed drivetrain. Good performance, but not a great value. Rating 4 out of 5. 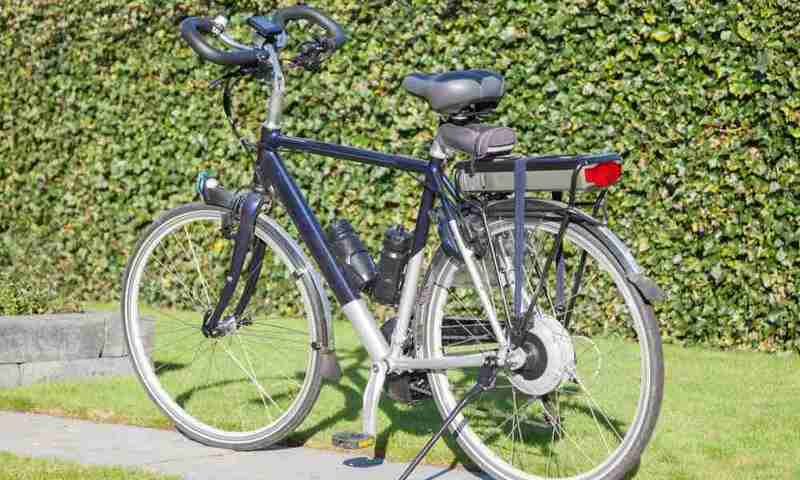 This sport hybrid electric bike by Yukon Trail Bicycles is designed primarily for on-road use. The first thing I noticed about this bike is that it has the worst brakes out of this group of bikes. Tektro mechanical v-brakes just like you’d find on a regular bicycle are what you get here. In my opinion with the increased weight and speeds involved, this is a mistake and also a safety issue. These brakes are simply unacceptable. The 250 watt motor that comes on this sport hybrid electric bike produces a top speed of around 15 miles per hour, and an average range of up to 31 miles. The range is excellent, but you’re going to have to stick to mostly flat ground to get anywhere near that. Power supply on this bike is a 36 volt, LiFePO4 battery rated at 10 amp hours. You can remove it from the bike easily to allow you to charge it in the most convenient place for you. Unfortunately, a battery charger is not included with this bike, so you’re going to have to purchase one separately. The drivetrain on the Xplorer Sport Hybrid is a Shimano 7-speed system. This is a limited number of gears, so it tends to decrease the usability of this bike. I would much rather see a higher number of gears available here. The frame on this bike is an aluminum alloy 18-inch one that’s coupled with an all-aluminum front suspension fork. The frame and fork are sized to be used with 26-inch wheels, which is what comes standard on this electric bike. The quality of these components seems to be very good. Overall, the quality of this package and the customer reviews of this electric bike are poor. This bike is heavy, has bad brakes, only has a few gears, and the price is way too high to put up with these defects. Rating 2.5 out of 5. 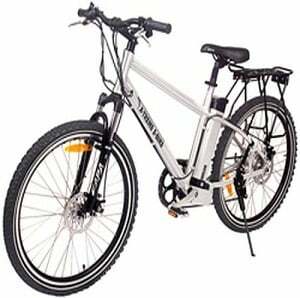 This is a m﻿en’s mountain bike that’s been equipped with an electric motor to help you when you need it. It’s made by X-Treme Scooters. 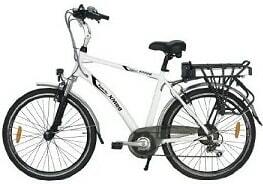 Electric assist power is supplied by a 300 watt electric motor mounted on the hub of the rear wheel. This gives you speeds up to 20 miles per hour, and a range of 20-25 miles on average. For an electric bike, these are solid performance numbers, and for the price of this bike, the numbers are great. This is the lightest men's lithium electric bike included in this group. It weighs in at only 52 pounds, and yes, that’s including the battery pack. Weight is the one thing that electric bikes have been struggling to lose, and X-Treme Scooters seems to have found the way to do it. This bike is easier to handle physically, and easier to stop. Lighter is better. The key to keeping the weight down might be the battery configuration. On this electric bicycle, they use seven 3.6 volt lightweight lithium batteries to form one 24 volt battery pack. Total output is 56 amps, and a charger is included with the purchase of this bike. This type of battery configuration is the future of electric bikes. I’ve mentioned several times how important brakes are on all bicycles, especially electric ones due to the increased speeds and weight. You don’t have to worry about braking with this bike, because it has mechanical disc brakes both front and rear. As long as your brake cables are properly adjusted, you’ll never have any problems stopping aboard this bike. The Lithium bike features three throttle modes for your use. You can select either twist throttle, which works just like a motorcycle or scooter, pedal with power assist, or variable speed control. Each mode has it’s place, and you’ll be thankful that you have all three. You’ll love pedaling while the electric motor gives you a little extra boost! Overall, this is an excellent electric bike if you base your choice on quality features and price. This is the best value among this group of bikes. Rating 4.5 out of 5. If you’ve been considering buying an electric bicycle, choosing any one of the products above is probably a pretty safe choice. However, I always like to name a winner when I research any product. For the Best Electric Bike for 2017, my champion is the X-Treme Scooters Men’s Lithium Electric bike. It’s loaded with quality features, plus it’s the most versatile bike in this group. I like how light it is, and the price makes it the best value for your money. The X-Treme Scooters Men’s Lithium Electric bike gives you both performance and value, so it’s my clear winner out of this group.